The Catholic Church on Saturday beatified in Algeria seven French monks and 12 other clergy killed during the country's civil war, the first ceremony of its kind in a Muslim nation. Papal envoy Cardinal Angelo Becciu read the official decree stating that the 19 men and women would "from now on be called blessed" at an event in the coastal city of Oran. Some 1,200 people, including pilgrims, relatives and friends of the beatified, filled the Chapel of our Lady of Santa Cruz as the service was held under tight security. The 19 Roman Catholic clergy were killed between 1994 and 1996 as Algeria was in the grips of a decade-long civil war between government forces and Islamists that left up to 200,000 people dead. Those beatified included seven French Trappist monks, who were murdered after being kidnapped by gunmen from the Notre Dame de l'Atlas monastery in Tibhirine in 1996. The Armed Islamic Group of Algeria claimed at the time that it had slit their throats, but responsibility for the murders has never been conclusively established. Only the heads of the men, aged between 45 and 82, were ever found. Also beatified was former Bishop of Oran Pierre Claverie, who was killed with his driver on August 1, 1996 when a remote-controlled bomb exploded at his residence. The five other religious men and six women honoured, including citizens of France, Spain, Belgium and Malta, were gunned down in 1994 and 1995. 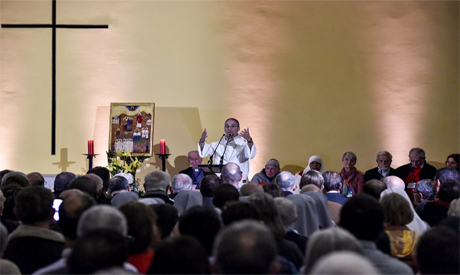 Opening the ceremony, Archbishop Paul Desfarges of Algiers paid tribute to "the thousands and thousands of victims of the Algerian civil war" from 1991-2002, describing them as anonymous heroes. "We did not want a beatification between Christians, because these brothers and sisters died among tens and tens of thousands of Algerian" Muslims, Desfarges said. Pope Francis himself spoke of the beatification in prayers at Saint Petr's Square in the Vatican on Saturday. Priest of Oran Father Thierry Becker said a prayer in Arabic for the Virgin Mary during the beatification ceremony in Algeria. Local Muslim dignitaries received the families of the 19 beatified clergy at the Ibn Badis Grand Mosque, in the presence of Cardinal Becciu and Algeria's minister of religious affairs. "We Muslims associate this event with much joy," Imam Mostapha Jaber said at the mosque. "These Christian martyrs killed during this national tragedy ... had a good mission -- (they were) determined to spread peace." The murders of the clergy garnered widespread attention both in Algeria and abroad. The deaths of the Trappist monks inspired a 2010 French film, "Des Hommes et des Dieux", (Of Gods and Men) starring Lambert Wilson and Michael Lonsdale that won the Grand Prix at the Cannes Film Festival. "The brothers and sisters who gave their lives did so in a conscious manner for the Algerian people," said Sister Benedicte of the Cross, who arrived from France for the ceremony. "Through them, we think of all those who lost their lives" during Algeria's civil war, she added.